From the sky shrouded by grey clouds above, snow fluttered down to the ground like puffs of cotton candy. As he trudged through the drifts of snow, Murasakibara Atsushi looked up at the sky with sleepy eyes. For Murasakibara, who had moved to Akita Prefecture in the spring to attend Yousen High School, the snow had been a novel sight at first. But the snow had continued to fall every day, and now, it was just another part of his daily life. Akita’s first snow had come early this year. Moreover, it snowed often. Even though it was only the middle of October, snowplows were already roving through the city, which was blanketed in white snow. 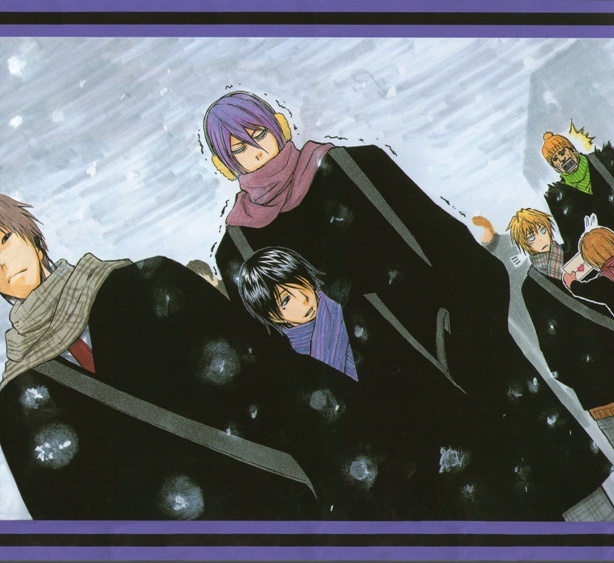 However, the snowfall at present was peaceful and fleeting, too light for Murasakibara and the others to need umbrellas. While he was staring up at the sky, Murasakibara opened his mouth. He thought it would be fun if a snowflake were to land on the tip of his outstretched tongue, but catching one proved harder than expected. He sullenly creased his brow, looking irritated but intent as he continued to walk with his mouth open. Himuro Tatsuya, who was walking beside Murasakibara, called out to him. At suddenly hearing their names spoken aloud, the captain, Okamura Kenichi, who was walking in front of them, and Liu Wei, who was walking behind them, started in surprise and looked at Himuro. Himuro continued speaking even as he felt their eyes on him, a pleasant smile on his face. When they saw the way Murasakibara looked at Himuro, obviously puzzled, both Okamura and Liu started shouting. While Okamura was shouting, Fukui Kensuke, who was walking beside him, clamped both hands over his ears to block out the noise. “Shut it, would you?! You’re disturbing the peace, so shut up already, you chin gorilla!” he roared. Despite standing two meters tall, Okamura rubbed his eyes and let his shoulders slump as he sunk into despair. In response, Fukui said, “Cut it out. That look doesn’t suit you at all,” thereby shattering Okamura’s unexpectedly naïve glass heart in one fell swoop. Fukui turned and raised his voice to address Murasakibara, Himuro, Liu, and the group of Yousen High School Men’s Basketball Club regulars who were walking behind them. As per Yousen High School’s educational policy, there was a class credit that required the students to complete a few hours of volunteer service each year. The volunteer activities were diverse and varied, ranging from cleaning up the surrounding neighborhoods to singing hymns in homes for the elderly. Under normal circumstances, each student would participate in his or her desired volunteer service on the school’s appointed “Volunteer Day”. However, this year’s Volunteer Day had conflicted with one of the basketball team’s official games a few days previously, and all of the regulars had been required to attend the game. The school had approved special measures to accommodate them: The newly designated Volunteer Day was today, and it was about to begin. Their appointed volunteer activity was making snow sculptures. The goal of this particular activity was to make snow sculptures in Ryokuchi Park, the largest park in the area, where the sculptures could be enjoyed by people in the neighborhood. Himuro chuckled in response to Murasakibara’s grousing. “One of our games conflicted with Volunteer Day back when we were freshmen. Ended up making snow sculptures that time, too,” Okamura said in his usual tone, having mended his wounded heart in a surprisingly short amount of time. As they dredged up some old memories, Okamura and Fukui’s expressions grew weary, and they sighed in unison. Liu immediately replied, “Thine habit of leading us on like that is incredibly annoying,” which made Okamura descend into another bout of depression. The first group to arrive at Ryokuchi Park had the opportunity to encounter “them” almost immediately. They were kindergarteners who had come to play in Ryokuchi Park. Gathering snow and making igloos and snowmen were activities that naturally piqued the kindergarteners’ interest. Their interest was compounded by the fact that the ones making the igloos and snowmen were a group of high school students. Moreover, the group was comprised solely of incredibly tall older boys, which only served to further spark the kindergarteners’ already insatiable curiosity. As the group of high school students used shovels to gather snow and tried to concentrate on their work, the kindergarteners bustled underfoot around them, like tourists queuing to observe pandas at a zoo. For some reason, Okamura was the most popular. While he piled up snow to use for making an igloo, the boys crowded around him and began inundating him with questions. “Who’re you callin’ ‘Gramps’?! !” Okamura shouted, but the kindergarteners found even his reaction amusing. They raised their voices in high-pitched laughter and ran away, scattering in all directions like a group of baby spiders. “Is there anybody else around? Just man up and accept it already,” Fukui said nonchalantly. He proceeded to ignore Okamura, to whom he had just dealt a crushing blow, and continued his work. As he did so, some of the kindergarteners approached them once more, and Fukui said, “Hey, don’t get too close. It’s dangerous,” mindful to keep a sharp eye on them. Although the kindergarteners refused to acknowledge a single word from Okamura, they obediently heeded Fukui’s warning. This only made Okamura sink even deeper into depression. Fukui’s words trailed off mid-sentence. Fukui replied, “Look at that,” and pointed a short distance away. Okamura did as Fukui said—and was immediately rendered speechless. Not far from them, Liu stood talking to the kindergarten teachers, a big smile on his face. Liu turned in surprise at the sound of Okamura’s yell. Okamura continued shouting and stomped toward Liu with enough force to set tremors rumbling through the ground. Liu fixed him with an icy stare. Fukui arrived on the scene and made to brush Okamura aside…but he was unable to budge the captain and therefore had no choice but to take a detour around Okamura before seizing Liu by the arm and dragging him away from the kindergarten teachers. When they had relocated a safe distance away from the teachers, Fukui rounded on Liu once more. From where he stood next to Fukui, Okamura started yelling again, a hint of jealousy in his voice. Fukui had not expected to hear his own name crop up in this conversation. His eyes went wide. Fukui stared blankly at Liu. Liu held his ground and stared squarely back at him. After a moment, Fukui clapped his fist on his palm. “Um, well…what can I say?” A smile lit on Fukui’s face, but it was a strained smile. When Fukui first met Liu, he had lied to him off the cuff and said, “It’s trendy to talk all old-fashioned like.” From that point on, Liu had persisted in speaking in an old-fashioned manner. (1) Fukui’s love of pranks had gotten the best of him then, and now he recalled the lie he had told Liu. Liu’s sharp eyes sharpened even further, and he trained his gaze on Fukui. A wrathful aura quietly began to gather around him. “‘Turn Passion…Off’…?” Liu repeated, suspicious. Beside Fukui, Okamura looked like he was dying to say something, but Fukui ignored him and continued trying to persuade Liu. Liu nodded, as if Fukui’s reasoning made perfect sense, and Okamura realized that he was very concerned about the state of Liu’s experience as an exchange student. What about Japan’s reputation…?! With the weight of his responsibility as a senpai on his shoulders, Okamura was growing anxious. However, he soon recalled that more pressing matters required their attention. That was one thing, and this was another. Right now, the class credit in their immediate future was more important than the long-term future of Japan-China relations. “C’mon, let’s get back to work. If we don’t get a move on, we won’t have time to finish,” Okamura said to Liu and Fukui. He then turned away and made to resume work on his igloo. As he did so, he caught sight of Himuro, who was stooped forward, his hands being pulled in opposite directions by two kindergarteners. “…what’re ya up to, Himuro?” Okamura called to him, dumbfounded. Himuro stopped walking and turned around. “Well, I just…” With a troubled expression, he looked down at the pair of girls who were pulling him back and forth. Each girl was squeezing one of Himuro’s hands in her own and refused to let go. “‘Play house’? !” Okamura, Fukui, and Liu yelled, sounding betrayed. The girls started arguing while they clung to Himuro’s hands. Himuro looked up at the sky in surrender. Fukui, who had been watching him, shook his head sadly, sharing Himuro’s sentiment. His shoulders slumped in defeat. As Liu and Okamura resumed bickering, which was the status quo, Fukui’s shoulders slumped again. —and nearly jumped out of his skin. Somehow, unbeknownst to Fukui, Himuro had come to stand right beside him. Okamura and Liu cried out in surprise when they saw Himuro, who had seemingly appeared out of nowhere. At the ominous connotation in those words, Fukui panicked and tried to catch a glimpse of the girls from where he stood. He didn’t have to look far, however, for they hadn’t moved from the spot where they had surrounded Himuro and spent the past few minutes fighting over him. But for some reason, the girls’ cheeks were flushed, and they were gazing dreamily at Himuro from afar, as if entranced. Okamura asked hoarsely, “What on earth did ya do to them?” He could no longer believe that he and this kouhai of his, who was wearing his habitual gentle smile, were members of the same human race. Himuro smiled sweetly, and Okamura, Fukui, and Liu felt the color drain from their faces. In spite of their reactions, Himuro was exceptionally calm as he continued, “Anyway, I don’t see Atsushi anywhere around here, so I’m going to go look for him.” With that, he took his leave and headed deeper into the park. As they watched him leave, Okamura and the others wore expressions that would suggest they had just been outwitted by a very cunning fox. A sorrowful cry reverberated throughout the park, and Okamura and the others snapped out of their reverie. Murasakibara was lazily lounging alone on a bench he had found near the outskirts of the park. He had started making a snowman, only to grow bored halfway through the process. After wandering through the park at length, he had finally arrived at this place, where he finished eating all of the snacks he had brought. 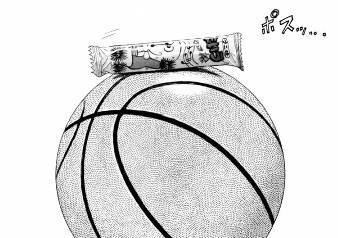 Knowing that he had such a long walk ahead of him, Murasakibara had brought more snacks with him than usual. But one of his bags of snacks had gone missing while he was working on the snowman, and its disappearance had robbed him of any and all motivation. Murasakibara raised both hands and stretched his arms wide. Not only was he bored beyond belief, but he was longing for something to munch on. With regret tingeing his voice, Murasakibara reclined on the bench, clasped his hands behind his head, and looked up at the sky. As always, snow was steadily falling. If only it tasted like cotton candy, too… With that thought in mind, he opened his mouth to catch more snowflakes on his tongue. Rustle, rustle. A faint sound came from somewhere beside him. Hn? Murasakibara turned his head, suddenly alert, and looked in the direction from whence the sound had come. On the vacant left-hand side of the bench sat a single piece of candy. And there, making to withdraw his hand after having placed the candy on the bench, was a small boy. His eyes met Murasakibara’s. The boy probably had not expected to get Murasakibara’s attention so quickly. He froze in place, staring at Murasakibara in astonishment. As if that one word were the incantation to release him from his temporary paralysis, the petrified boy’s shoulders trembled as he started in surprise, and he bolted, heading for the hills as fast as his legs would carry him. Murasakibara stared after the boy in bewilderment as he dashed toward a tree growing on the opposite side of the footpath from the bench. Using one hand to brace himself, the boy pivoted around the tree and hid behind it. Perhaps because the boy had braced one hand against the tree, the snow that had accumulated in the branches above fell on top of him with a thud. Murasakibara was naturally alarmed by this sudden turn of events, and he hurried toward the boy. Fortunately, only a small amount of snow had fallen from the tree. Still, the boy had been forced to the ground by the impact, and the pile of snow came up to his waist. “Oh no, look what happened.” Murasakibara reached out with both hands, grasped the dazed boy under both arms, and lifted him out of the snow with ease. The boy was heavier than a basketball, but he hardly weighed enough to pose any difficulty for Murasakibara. The boy’s eyes were wide from the shock of being buried in snow. But now, after having been lifted into the air so easily, his eyes widened even further as he stared at Murasakibara. “You okay?” Murasakibara asked, the boy still in his arms. His words became incoherent, and translucent tears brimmed and fell from his eyes. That tearful face miraculously managed to catch the giant, 208-centimeter-tall high school student off guard, and Murasakibara ran this way and that in confusion, still holding the boy. Okamura knit his brow in concern after Fukui relayed the story to him. “Yeah, that’s why they’re making such a big fuss about it,” Fukui replied, his expression grim. The heartrending cry they had heard not long ago had belonged to one of the teachers. Okamura and the others had seen the teachers calling, “Acchan, Acchan!” as they searched high and low throughout the area, so Fukui had gone to inquire about the situation. The teachers were still frantically searching for “Acchan”. However, they needed to look after the rest of the kindergarteners at the same time, so they were clearly shorthanded. “What might this ‘Acchan’ look like?” asked Liu, who was also aware of the situation. The regulars assembled with all possible haste. Okamura explained the situation to the group of regulars then divided the search area among them. It was decided that they should contact Fukui or Okamura if they found the boy in question, and with that, the impromptu search party departed on their mission. After they watched the search party dash off into the snow, Fukui noticed that Liu was standing stock still, his gaze transfixed. “Liu, what’s up?” Fukui asked as he approached Liu. Liu’s face was pale as he pointed to the pile of snow Okamura and Fukui had gathered to use for building the igloo. Okamura came to join them, having noticed their unusual behavior. He looked at the pile of snow he and Fukui had gathered. They caught a fleeting glimpse of something black jutting out near the base of the massive pile of snow. “Whaaaaaaa—? !” Okamura cried. He fell to his knees in a panic and started tunneling through the snow. Liu and Fukui immediately followed suit. With a yell that bordered on a scream, the three of them began demolishing the pile of snow. And thus, a great tragedy was set in motion. “…no more tears?” Murasakibara asked the boy, who had finally managed to stop crying after Murasakibara seated him on the bench. When they were both sitting down, there was such a great difference in height between them that all Murasakibara could see of the boy was the top of his head. Even so, he was still able to discern when the boy nodded stiffly in response. The boy sniffled, his nose running, so Murasakibara started rummaging through his pockets. However, all that emerged from his pockets was a pile of empty bags that had formerly held snacks. As Murasakibara said this, the boy withdrew a tissue from the pocket of his own black down jacket and blew his nose. Even though Murasakibara was still young enough to be considered one of the “kids these days”, he gazed at the boy in admiration. The boy had probably never expected to receive praise for simply having a tissue with him. He froze for a split second, stunned, but he quickly recovered and replied, “…yeah,” sounding both happy and a little embarrassed. It seemed Murasakibara’s praise had helped the boy work up the nerve to speak. “U-um…!” he started, determination in his voice, as he finally raised his head and looked up at Murasakibara. He had to crane his neck as if he were looking almost directly upward. Eyes still wet with tears, he fixed his gaze on Murasakibara. The boy continued to look at Murasakibara, his expression full of hope. He looks even bigger up close… As the boy sat before Murasakibara, who was the tallest person he had ever seen, his body was consumed by a sense of heart-pounding nervousness. He had come to play in the park with the kindergarten teachers and the rest of his class, so it was only by chance that he caught sight of Murasakibara. However, the moment he laid eyes on him, he knew instinctively that if anyone could help solve his problem, it would be this person. In truth, he had wanted to try to talk to Murasakibara as soon as possible, but, as one might expect, he was overwhelmed by Murasakibara’s size and unable to pluck up the courage to do so. Instead, he had trailed after him at a distance, which explained how he had wandered all the way to the very outskirts of the park. Murasakibara, as the object of the boy’s attention, kept his head tilted to the side as he murmured, “Hmmm…,” and then fell silent. The silence dragged on, but just as the boy began to feel anxious, Murasakibara finally replied, “Just eat and sleep, I guess…,” although he didn’t sound very confident in this answer. Just as Murasakibara thanked the boy with a small smile, he heard someone call his name. When he turned to look, he saw Himuro walking down the footpath toward them. Murasakibara’s expression resembled that of a child caught playing a prank. Himuro came to a stop in front of him, his expression perplexed. Himuro studied Murasakibara, unsure what he meant by those words. However, even after receiving a less-than-helpful explanation from Murasakibara, Himuro managed to make sense of the situation, and he stooped down to the boy’s level so their eyes could meet. The boy glumly cast his eyes downward. “When we line up, I’m always in front, and when we have races, the big kids always win, and I can’t reach the highest horizontal bar, so it’s no fun at all,” he insisted. The boy sat on the bench, swinging his legs back and forth in small circles, his feet not even touching the ground. Himuro and Murasakibara shared a look. Both of them had been tall ever since they were young, so they initially drew a blank at the boy’s words. As he remembered the countless times in middle school they had been told, “Meet in front of the main gate, under Murasakibara,” Murasakibara puffed out his cheeks in discontent. Yeah, that would be a little much…, Himuro thought with a wry smile, but the boy said, “How nice…,” and let out a slightly envious-sounding sigh. There was a hint of loneliness in Himuro’s smile as he gently caressed the boy’s head. The boy heaved a heavy sigh at being touched so gently, as if some untold emotions were welling up within his chest. Tears brimmed in his eyes. At the sudden change in topic, the boy looked up at Murasakibara in surprise. Because he was now looking upward, his tears quietly receded before they could spill down his cheeks. 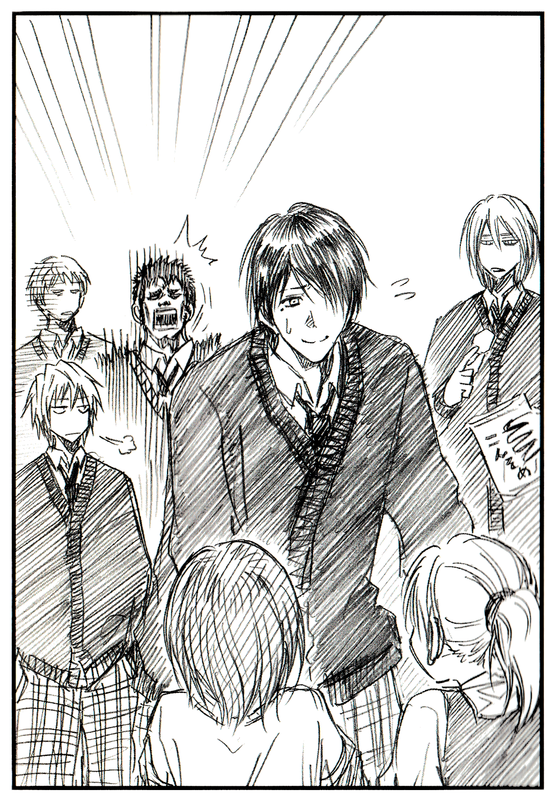 Himuro also stared patiently at Murasakibara, nonplussed. The boy nodded, confused, and Murasakibara replied, “Hmmm…,” squinting his eyes as he gazed into the distant sky. “‘Akachin’?” The boy echoed this unfamiliar word, but Murasakibara said nothing further. Himuro began to speak in his stead. The boy looked up at Murasakibara again. Murasakibara was, as always, staring up at the sky. However, the boy noticed something. Murasakibara’s mouth was quirked ever so slightly in a smile. A smile slowly spread across the boy’s face. He clenched his small fists tightly as he made this declaration. Himuro smiled gently and nodded, while Murasakibara said, “Good for you, huh?” with a yawn and stood up from the bench. The boy followed his example and hopped down from the bench. Together, they started walking back to the area where the regulars had been making snow sculptures. Himuro chuckled when Murasakibara grew defensive, but he didn’t press him any further. Murasakibara and Himuro were showered with gratitude from the kindergarten teachers when they returned together with the boy. For the boy was none other than “Acchan”, the kindergartener who had gone missing. The teachers bowed time and time again to Murasakibara, but he simply replied, “I didn’t even do anything…,” in a sleepy voice. At present, his attention was focused on something else. As his words would imply, the snowmen and igloos that the regulars had worked so hard to make had been tragically razed to the ground. Near the largest, most conspicuous pile of wreckage, Okamura, Fukui, and Liu were sprawled on the ground, seemingly at death’s door. Okamura staggered upright and handed Himuro a bag of black pepper-flavored potato chips. The chips were packaged in a black bag. Murasakibara happily snatched the bag of potato chips from Okamura. “I knew it was yours…!” Fukui said, unable to stand, his voice trembling. Himuro was, quite rightly, having trouble comprehending the situation, so Fukui began to explain it to him bit by bit. Everything started when they spotted the vinyl bag of the black pepper-flavored chips poking out of the snow piled up for the igloo. Thinking that the bag might be the missing boy’s clothes, Okamura, Fukui, and Liu had frantically demolished the pile of snow to determine whether or not this was the case. Of course, they soon realized that it had been an unfortunate misunderstanding. Just when they thought they could breathe easy again, however, it became apparent that the tragedy was already in full swing. Inspired by watching Okamura and the others demolish the pile of snow, the kindergarteners had begun destroying the rest of the half-finished snow sculptures. They had rushed to try and stop them, but it was too little, too late. Thus, the igloos and snowmen had been reduced to their current, tragic state. “Aww, but you worked so hard…,” Murasakibara said, seemingly unconcerned. From where they sat on the ground, dead tired, Okamura, Fukui, and Liu cursed Murasakibara in their hearts, thinking, If only you hadn’t gone missing…!, but they didn’t have the energy to voice this sentiment. They had exhausted the last of their strength by running about in an effort to stop the destruction of the snow sculptures. And now, above all, an extremely serious problem weighed on their minds. —so, what about our class credit? “Volunteer Service” was considered a class at Yousen High School, and the basketball club was supposed to earn class credit for completing the snow sculptures. But now, it was evening. They no longer had the time or strength necessary to finish the project. Without that class credit, however, their eligibility for the Winter Cup was in jeopardy. The Yosen High School basketball club regulars were truly in a tight spot. “…hey, what’re we gonna do, Captain?” Fukui called to Okamura from where sat in the snow. Okamura crossed his arms and was silent, his expression gloomy. The other regulars expectantly awaited orders from Okamura. At that moment, someone called out to them. Taken aback, they turned toward the source of the voice. Standing there, holding an umbrella and bundled in a coat, was their coach, Araki Masako. Araki took a hard look at the remnants of the snow sculptures and frowned. Okamura stood up to offer a full explanation, but before he could, several figures approached them. The basketball club was holding an emergency meeting in their clubroom before practice. The topic of discussion was, of course, the “Volunteer Service” class credit. From where she stood before them, Araki soon began to speak. “They did all that for us, huh…?” Okamura replied, glaring daggers at Murasakibara all the while. His expression clearly said, This is all ‘cause you were slackin’ off!, but the look went unnoticed by Murasakibara, who was busy munching on a chocolate bar. “Coach, what are we doing for our next volunteer activity?” Himuro asked. A shock coursed through everyone present. Frizzy, matted hair; a huge, gaping mouth; and large, protruding fangs. It was that mask—one with which they were intimately familiar. A bass-octave scream reverberated throughout the clubroom, loud enough to make the walls shake. “C-Coach! Are you serious? !” Fukui asked incredulously, sitting on the edge of his seat. “B-but the Winter Cup is at the end of the year!” Himuro exclaimed, uncharacteristically flustered. “But I don’t think they’ll have a costume to fit me…,” Murasakibara said drowsily, implying that the situation had nothing to do with him. Araki chuckled, which she seldom did. “They’re the ones who used to do the embroidery on the overcoats for the gang. They’re pretty skilled, you know,” she said, happy to boast about her former protégées. Now there’s no way we can refuse…! A shudder ran through the assembled regulars as this realization dawned on them. Araki placed the ogre mask on the desk and left the room at her customary brisk pace. The club members remained where they were, still in shock. Not one of them made to get up. It is said that the soulful cry of the basketball club was in such splendid harmony that it made the Yousen High School Chorus Club green with envy. 1. Aru is the stereotypical verbal tic that some Japanese media uses to characterize Chinese speakers of Japanese. This stereotype is derived from the copula de arimasu / de aru, which is the formal, literary (and in some cases, archaic) form of desu. Anyone familiar with Kagura from Gintama or China from Hetalia is probably familiar with this stereotype. More info here. Fukui literally tells Liu that it’s popular in Japan to add aru to the end of one’s sentences. For consistency’s sake, I followed Akashi Scans’ decision to translate Liu’s speech with formal, stilted language. See the Kuroko no Basuke NG at the end of chapter 146 in the manga. 3. Namahage are demonic beings in Japanese folklore characterized by their shaggy hair and red, blistered faces. On New Year’s Eve in Akita Prefecture, men dress up as namahage, wearing ogre masks and straw capes and carrying drums and fake knives. While in costume, they visit the neighborhood children, admonishing them for lazy or naughty behavior and encouraging them to be good for their parents. Thanks for sharing that link! I’ll give you credit for the scan.